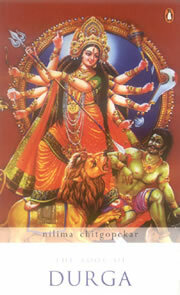 Durga is unattainable, unfathomable, the Invincible One. Myths associated with her origin tell us that she is 'Shakti' - the female manifestation of cosmic energy - created by the fusion of the fierce energies of all the male gods and stronger than their combined strength. She is the scourge of demons, as she is protectress of the realms of gods and humans. He anger is terrifying, her lust for victory in the war overwhelming; on the battlefield she is merciless, even savage. Yet, she may just as easily transform into the consort of Shiva, daughter of the mountains, sister of the gods, or mother of her four children and of all mankind. It is this complexity that the author of The Book of Durga explores as she takes us through captivating interpretations of myths, rituals,ancient scriptures and iconographic representations to unravel the enigma that is Durga. Her intense passion for the awesome power and majesty of the warrior-goddess couples with meticulous research to make this book a truly fascinating read.